Propping up the dignified elements of the constitution: the peculiarities of the Court Circular | Who Runs Britain? Tucked away at the back of The Times newspaper, somewhere between the obituaries and the weather, is the Court Circular. The Court Circular is a record of the previous day’s royal engagements. It is a peculiar report consisting of a simple list of engagements without commentary or photographs. Engagements are listed in order of succession, with the Queen’s engagements listed first and running through to the Duke of Kent (31st in line to the throne). Announcements are also listed by palace rather than individual royals. Hence the Queen’s engagements are listed under Buckingham Palace, as are those for Prince Andrew, Prince Edward and Princess Anne. Princes William and Harry’s engagements are issued by Kensington Palace, and those relating to the Prince of Wales by Clarence House. Formal titles are used throughout, Princess Anne is The Princess Royal, Edward the Earl of Essex and Prince Harry, is Prince Henry of Wales. The Court Circular was reportedly begun by George III in 1803. Frustrated by inaccurate reports of royal engagements in the national newspapers he appointed a ‘Court Newsman’ to provide the press with a daily record of engagements. According to the Palace the Court Circular is written by the Private Secretary’s Office at Buckingham Palace and a copy is always approved by the Queen before it is published. It is reported verbatim in three national newspapers, The Times, The Daily Telegraph and The Scotsman. 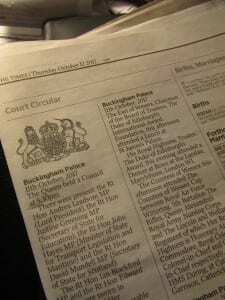 Copies of the Court Circular, as reported in The Times, are clipped in the Palace and kept in bound volumes in the Royal archives. The Court Circular is undoubtedly a fascinating record of the work undertaken by members of the royal family, and is presumably considered to be a useful demonstration of the way in which the royals provide value for money. Indeed, since 1979, Tim O’Donovan, a retired insurance broker and avowed royalist from Berkshire has kept a running total of royal engagements producing an annual league table of the most active royals which is published in the letters page of The Times at the end of each year. The 2016 list was topped by Prince Charles with 530 engagements, closely followed by his sister, Princess Anne who carried out 509. It is not just the number of royal engagements but also the breadth of activities which is revealed by the Court Circular. On the 11th October, for example, the Princess Royal, in her capacity as President of the UK Fashion and Textile Association, opened the pattern weaving shed at Holland and Sherry Limited, in Peebles in the Scottish borders. As President of Riding for the Disabled, she then visited their Berwickshire group headquarters in Eyemouth. In the afternoon, as President of the Scotch Beef Association, she visited Hardiesmill Farm in Berwickshire before heading back to London to attend the Court Autumn Dinner of the Fishmongers’ Company, for whom she is ‘Prime Warden’. While such a busy daily schedule is not uncommon, particularly for the Princess Royal, not all members of the royal family are quite so busy. For example, on the same day that the Princess Royal was touring the Scottish borders, the Court Circular reported that the Duke of Kent, attended a dinner at the Cavalry and Guards club in Piccadilly. More significantly, the Court Circular provides a record of the intersection between the monarchy and politics. Most notably it provides a record of meetings of the Privy Council, lists those in attendance and announces the appointment of new members. It was the Court Circular which reported on 11th November 2015, that Jeremy Corbyn had become a member of the Privy Council and that he had, ‘made affirmation’, rather than being sworn in on the Bible. It also records meetings between the monarch and the Prime Minister, although the content of such meetings, of course, remains secret. It revealed, for example, that last week the weekly meeting between the Prime Minister and the Queen took place on Wednesday, rather than on Tuesday as is customary. This was presumably because, as was reported in the previous day’s circular, the Queen arrived back from Balmoral on Tuesday, and was perhaps too tired or too late to attend, although such extraneous details are obviously not provided. 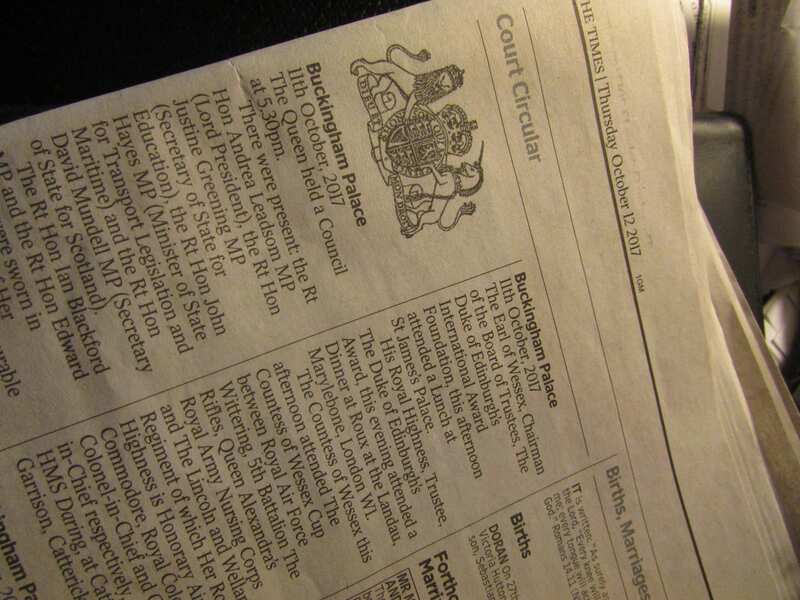 What is perhaps most unusual is that three national newspapers continue to print the Court Circular. While it does serve to provide an element of transparency in relation to some of the more opaque aspects of the British constitution, the Court Circular is now available on the Royal Family’s, detailed and prodigious, website. The Royal Family also have Facebook, Instagram and Twitter accounts. Had George III had the benefit of the internet it seems unlikely he would have bothered with the services of a court newsman. The Times stopped devoting a full page to reporting the previous day’s debates in Parliament in 1990. It is perhaps indicative of the endurance of what Walter Bagehot termed the dignified elements of the British constitution, that they continue to be a feature of some of our national daily newspapers, long after regular reporting of the efficient (and democratic) elements has ceased. This entry was posted in Uncategorized and tagged Constitution, monarchy, Privy Council. Bookmark the permalink. Pingback: Mr O'Donovan's annual survey of royal engagements | Who Runs Britain?